Just a little over 6 months ago, Brett and Kirilly Butterworth established Brilly Haulage from a standing start. No customers, no premises, no contracts – just healthy doses of enthusiasm and determination. Historically, Brett had been a part-owner of Dewatering Services Australia, located in the centre of Western Australia’s Goldfields. Dewatering Services Australia (DSA) was an industrial pipe manufacturer and installer which performed pipework and earthworks for industrial shutdowns, maintenance upgrades and emergency repairs. With the growing business came the attention of Resource Equipment Ltd (REL), who eventually brokered a deal to purchase DSA, leaving Brett as a Regional Manager in the Goldfields. Brett and Kirilly met whilst working in the mining industry and were now armed with knowledge of the pipe industry along with a desire to develop a new business opportunity to take into the next stage of their lives. Brilly Transport now own two Freighter trailers, a flat top extendable and a drop deck extendable, both of which are road train rated to suit the Western Australian industry. During his career working in the pipe industry, Brett had continually noticed a requirement for pipe transport services in the region. Feeling that this was the opportunity they had been looking for, Kirilly drew up plans to create a start-up business transporting the pipe that Brett’s company had once needed. With a wide range of friends in the transport industry and a tight community in Kalgoorlie, Kirilly wanted to be sure she wouldn’t alienate neighbours and friends by pursuing the new business idea. So, she and Brett did a circuit of all their contacts and talked about her plans to offer specialist extendable transport services to the pipe industry, plus any other operators who needed them. To her delight, apart from encouragement, she also got clear direction about the equipment she’d need. For trailers there was only one recommendation – Freighter. “Once you get a Freighter you don’t look back,” she was told when talking about her plans for the future. And with that, Brilly Haulage was formed. Brett approached Mike Dawson, Northern Area Sales Manager for the local Freighter dealership, MaxiTRANS W.A., with some clear ideas of the kind of trailers Brilly required. They needed to be able to carry the large pipes that they had founded the business for, but also had to be flexible enough to carry standard loads should the need arise. 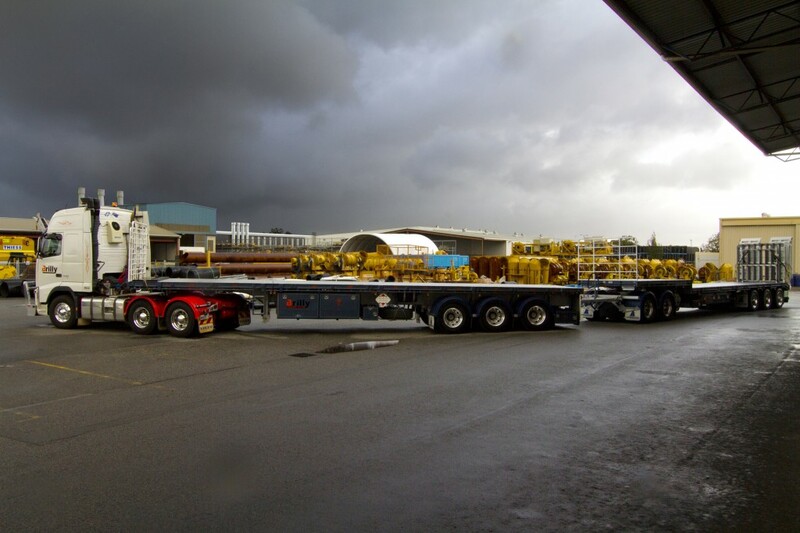 Based on these multiple task requirements from Brilly, Mike worked with Freighter’s engineers to design a custom drop deck extendable semi-trailer. At the first stage (closed), the trailer is rated at 32-tonne, stepping down to 20-tonne when fully open. Self-supporting loads up to 32-tonne can of course be carried at maximum length. This allows Brilly to haul minesite dongas without pedestals, as well as handling their customers’ longest pipe sections. The Freighter drop deck extendable semi is rated at 32-tonne and 20-tonne when fully extended. Additionally, when Brett was finalizing the design he asked to include Meritor’s reliable CS9 tri suspension module, along with wireless air scales. With read-outs on each axle, the scales also send live data via Bluetooth to the cab, where the driver can keep a close eye on weights without getting out and around the rig. According to Brett, the system allows Brilly Haulage to comply with regulations as well as improving efficiency and operator safety. When the driver connects the truck, he immediately knows what he has behind him. 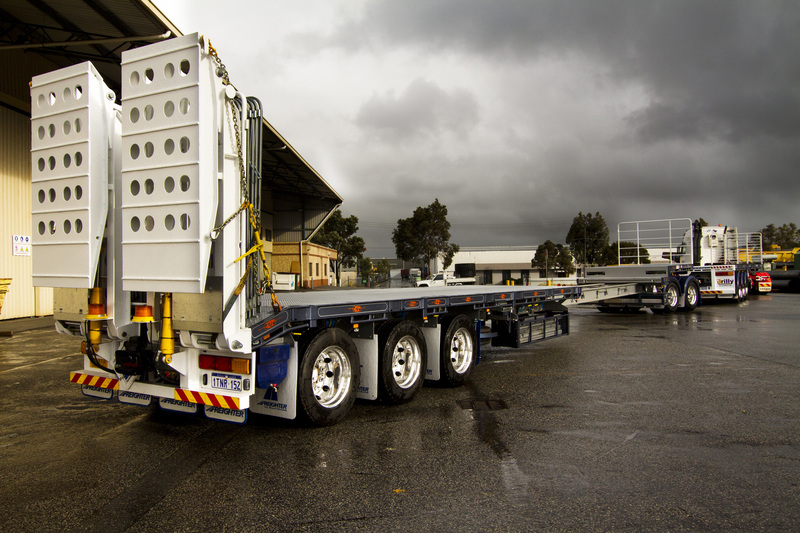 The Freighter trailer technology has helped Brilly secure WA Heavy Vehicle Accreditation and the business is already fitting interstate work in with the local jobs. Right now, Kirilly runs the haulage business with Brett helping out in his spare time away from work. The new drop deck extendable adds to the existing flat top extendable and means Kirilly now has two custom built Freighter trailers in a fleet that seems destined to grow. Both current trailers are road train rated, and the unitized bearings insisted on by Brett mean Kirilly is expecting 1 million kilometres between replacements. She also specified Volvo rims for the trailers, as she wanted to maximize interchangeability of as many key components between the prime mover and the trailers as possible. Kirilly says her next trailer will be a multi-role Tautliner, which she and Brett are once again working with the guidance of Mike Dawson to design. “Mike’s always happy to help,” Kirilly said. “It makes a huge difference having an engineering background when you’re talking about specialist tasks and Mike has never let us down. He listens rather than just hears.” As the business is still growing, all the equipment has to be multi-task and Kirilly says the new Tautliner will be no exception. Kirilly Butterworth is proud of the business she and husband Brett (right) have been able to put together. Although Kalgoorlie is not a small town, it is almost totally isolated, meaning there is a strong incentive to working with local businesses. Kirilly was expecting a slow start when the business was launched, but she hit the ground running, with REL using Brilly to back up its own fleet. Brilly also has contracts with a national logistics group for extendable work in the area, plus a South Australian group that needs occasional help on the east-west run.